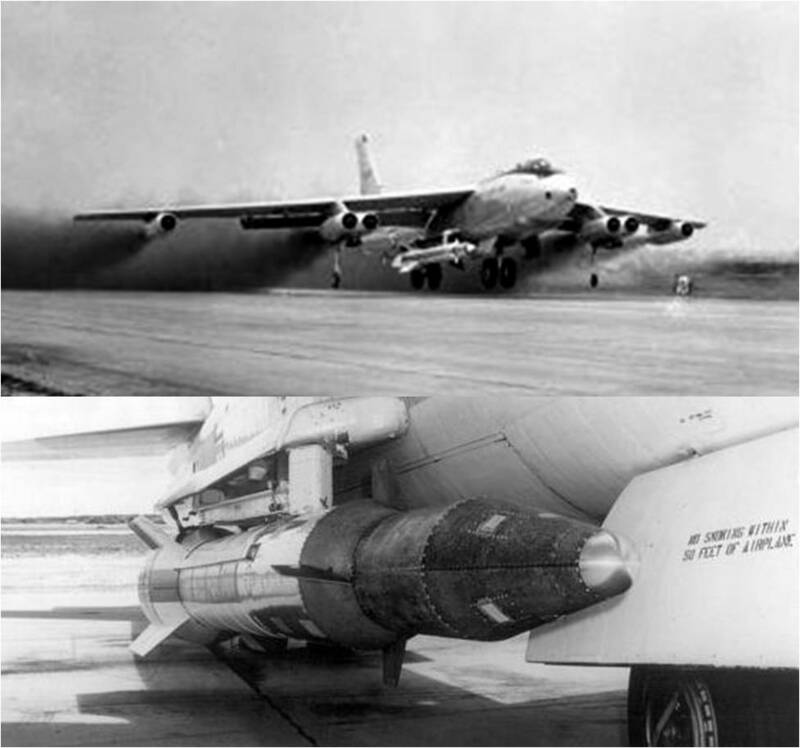 Fifty-four years ago today, the USAF/Northrop SNARK intercontinental cruise missile successfully flew its maximum range mission of 5,000 statute miles for the first time. SNARK would go on to become the only strategic cruise missile ever operationally deployed by the United States. The SM-62A SNARK was designed to deliver nuclear ordnance at strategic ranges. The vehicle was conceived as an autonomous, winged, turbojet-powered aircraft with a high subsonic cruise capability. Ground launch was provided by a pair of disposable, high-thrust rocket boosters. The SNARK’s origins date back to the middle 1940’s. The missile’s name, SNARK, is not an acronym. Rather, SNARK has reference to the mythical creature highlighted in Lewis Carroll’s poem, “The Hunting of the Snark”. Jack Northrop, president of Northrop Aircraft Company, developer of the SNARK, is credited with selection of the missile’s name. SNARK engineering development and flight testing took place between 1946 and 1960. This protracted gestation period was partially due to mission requirements drift on the part of the Air Force. However, challenging technical problems, a flat funding profile and mission relevancy issues also served to draw-out the development effort. The original SNARK prototype was designated as the N-25 by Northrop. The missile was designed to fly 1,550 statute miles and cruise at Mach 0.85. N-25 flight testing occurred between December of 1950 and March of 1952. While the results were not particularly encouraging, USAF still wanted a strategic cruise missile. This led to the development of a larger, more capable airframe designated as the N-69. The N-69 SNARK configuration measured 67.2 feet in length and featured a wing span of 42.25 feet. Launch weight was roughly 49,000 lbs. Power was provided by a single Pratt and Whitney J-57 turbojet that generated a sea level thrust of 10,500 lbs. The missile carried a single W39 nuclear warhead with a yield of 3.8 megatons. The SNARK was ground-launched using a pair of Aerojet General solid propellant rocket boosters that produced a combined thrust of 260,000 lbs. The complete launch stack weighed 60,000 lbs. The design operational range for the N-69 airframe was 5,500 nm. The type had a top cruise speed and ceiling of 650 mph and 50,000 feet, respectively. Maximum mission time was on the order of 11 hours. Northrop was constrained to use a celestial navigation system to get the SNARK to its distant target. The company optimistically advertised a CEP of 8,000 feet. On Thursday, 31 October 1957, a SNARK N-69E airframe (S/N N-3324) successfully flew a strategic range flight for the first time. Launch occurred from either LC-1 or LC-2 (the historical record is unclear here) at Cape Canaveral, Florida. The missile flew 5,000 statute miles to its target near Ascension Island in the South Atlantic Ocean. While the range achieved on the SNARK’s Halloween 1957 flight test was impressive, guidance system accuracy was quite poor. Indeed, guidance system performance deficiencies plagued the SNARK Program throughout its life. Witness the fact that through May of 1959, the best the SNARK guidance system could do on long range flights was impact within 4.3 nm of the target. Moreover, the first guidance flight to be successfully completed did not occur until February of 1960. The latter 1950’s saw rapid development of successful Intercontinetal Ballistic Missile (ICBM) systems within the United States and the Soviet Union. These suborbital warhead delivery systems outperformed the SNARK by every measure. In spite of its obvious obsolescence, low reliability and marginal accuracy, USAF opted to field the weapon anyway. The first and only SNARK missile wing, consisting of 30 airframes, was operationally-deployed at Presque Isle AFB, Maine in February of 1961. However, the type’s deployment period would be brief. Newly-inaugurated President John F. Kennedy cancelled the SNARK Missile Program soon after taking office. As a result, the SNARK missile wing at Presque Isle AFB was deactivated in June of 1961. America’s aerospace history is filled with unique aerospace systems that saw limited or no operational service. Notable examples include the Navaho, B-70, F-107, X-20 and the X-33. While these vehicles never filled the measure of their creation, the technology and capability accrued during their development greatly benefitted succeeding generations of aerospace craft. Such is the case for SNARK. Indeed, historically importnant operational missile systems such as Jupiter, Atlas, Minuteman and Titan were direct heirs of technology, capability and technical lessons-learned derived from the SNARK experience. J. Terry White, CEO and Aerosciences Instructor at White Eagle Aerospace, recently held his acclaimed Aerodynamics For Engineers (AFE) short course at Edwards Air Force Base, CA. The course, which provides a comprehensive training experience in basic aerodynamic principles applicable to the subsonic, transonic, supersonic and hypersonic flight regimes, was held 24-27 October 2011. 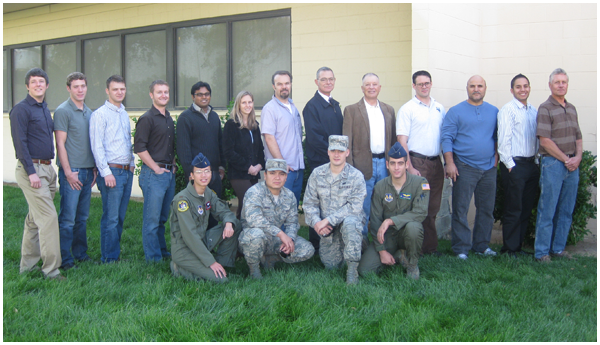 White Eagle Aerospace is honored to serve the United States military and civilian personnel at Edwards AFB and would like to sincerely thank each student who attended this course. In addition, the WEA team extends special gratitude to Ms. Cathy Clum and Ms. Linda Harrison – whose time and assistance have been invaluable. Fifty-nine years ago this month, the USN/Douglas XA3D-1 Skywarrior prototype strategic bomber made its initial test flight at Edwards Air Force Base, California. Legendary Douglas test pilot George R. Jansen was at the controls of the swept-wing, turbojet-powered, carrier-based aircraft. The USN/Douglas A3D Skywarrior was the product of late 1940’s Navy studies calling for a carrier-based, long range bomber capable of delivering a 10,000 lb bomb load. Douglas Aircraft Company was awarded a contract to manufacture and test a pair of XA3D-1 airframes (BuAer No. 125412 and No. 125413) in 1949. Westinghouse was selected as the powerplant provider. The XA3D-1 had a design weight of roughly 68,000 lbs, which would allow the aircraft to operate from existing Navy aircraft carriers. Power was provided by a pair of Westinghouse J40 turbojets. Each of these powerplants generated 7,500 lbs of military thrust and 10,500 lbs of afterburner at sea level. Unfortunately, the XA3D-1 was underpowered with these powerplants. In any event, the J40 engine experienced significant development problems and never did see production. The No. 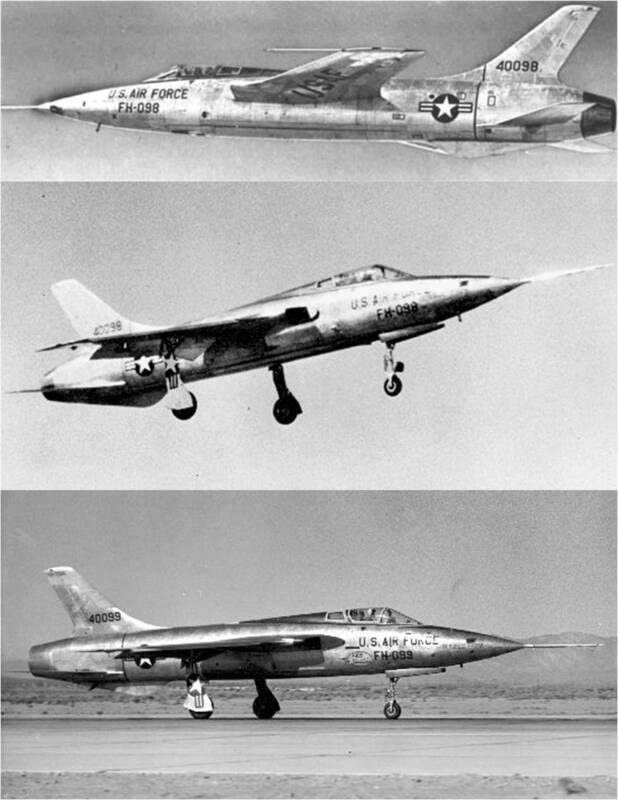 1 XA-3D-1 (BuAer 125412) made its maiden flight on Tuesday, 28 October 1952 with Douglas test pilot George R. Jansen doing the piloting honors. Although a Navy program, the flight was conducted at Edwards Air Force Base in California. The safety provided by the presence of the world’s longest (11.5 miles) natural runway, Rogers Dry Lake, was one reason for doing so. The XA3D-1 initial test hop was unremarkable. The results of early Skywarrior testing significantly aided the evolutionary development and improvement of the aircraft. The A3D-1 was the first Skywarrior variant to see limited production. This was ultimately followed by the A3D-2; considered by many to be the definitive Skywarrior. Large for a carried-based aircraft, the Skywarrior was nick-named “The Whale”. The A3D-2 measured 76.3 feet in length and had a wing span of 72.5 feet. Wing leading edge sweep and planform were 36-deg and 812 square feet, respectively. The aircraft had a GTOW of 82,000 lbs versus a empty weight of 39,400 lbs. Power was provided by twin Pratt and Whitney J57-P-10 turbojets. Each powerplant generated 10,500 lbs of military thrust at sea level. Each engine could produce an additional 2,400 lbs of thrust using water injection. The A3D-2 could carry a maximum conventional or nuclear bomb load of 12,800 lbs. Maximum unrefueled range was 1,826 nm. With a service ceiling of 41,000 feet, the aircraft typically cruised at 452 knots. Maximum airspeed was 530 knots. The A3D-2 flight crew consisted of a pilot, navigator and bombardier. Interestingly, the crew was not provided with ejection seats as a cost-saving measure. This led Skywarrior crews to asert that “A3D” was actually an acronym that meant “All 3 Dead”. While the Skywarrior was designed as a strategic bomber, the aircraft was used in other roles over the course of its long operational life. Indeed, the Skywarrior was modified to serve in the electronic warfare role, as a photo-recon platform and as an aerial tanker. Historical records indicate that 282 Skywarriors were produced between 1956 and 1961. The Skywarrior and its crews served faithfully throughout the Cold War period including Vietnam. Significantly, the Skywarrior holds the distinction of being the largest and heaviest aircraft ever to see operational service aboard an aircraft carrier. The last operational Skywarriors were taken out of the active inventory in September of 1991. 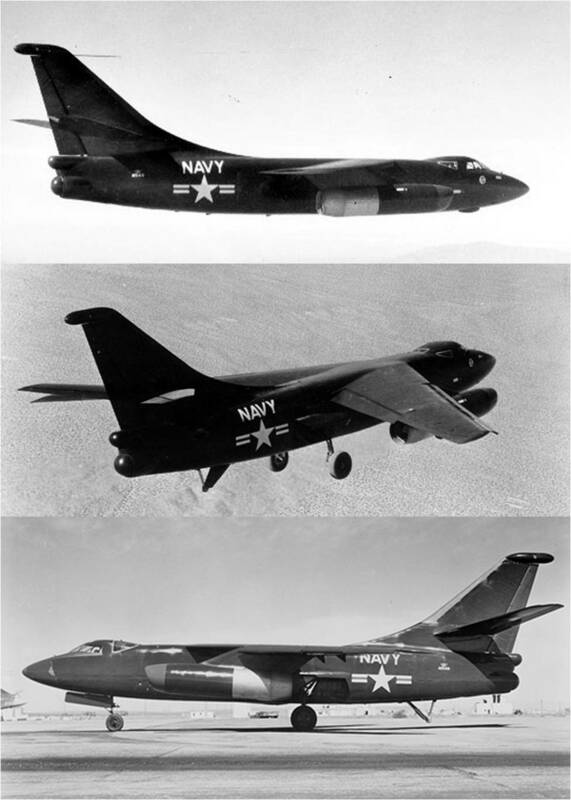 As a further tribute to the Skywarrior, the Air Force liked the aircraft so much that it contracted with the Douglas Aircraft Company to design, test and produce a very similar aircraft; the B-66 Destroyer. First flight occurred in June of 1954. Operationally, the B-66 was used primarily in the electronic warfare and recon roles. A total of 294 airframes were ultimately produced for the junior service. Happily, ejection seats were standard equipment. On 11-14 October 2011, White Eagle Aerospace made its debut visit to the Ohio Aerospace Institute in Cleveland, OH where CEO J. Terry White taught his increasingly popular Fundamentals of Hypersonics (FOH) professional short course. 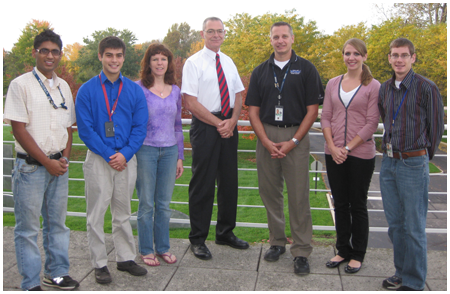 The course drew participants from NASA Glenn Research Center, also located in Cleveland, OH. The FOH course presents a thorough treatment of hypersonic flow physics, gas dynamics, aerodynamic heating, plasma effects, aeroacoustics, and flight vehicle force and moment characteristics. Course material also introduces participants to a myriad of other aerodynamics-related topics that are intimately related to hypersonic flight test and flight research operations. The Ohio Aerospace Institute (OAI) provides education and training services that support the dynamic educational needs of the aerospace economy. In addition to its education and training efforts, OAI and its partners engage in research and collaborative efforts that lead to innovative and cutting-edge technological solutions to complex aerospace problems. White Eagle Aerospace sincerely thanks each student in attendance, in addition to the following key individuals who helped facilitate this course: Ann O. Heyward, Vice President, Research and Educational Programs and Rebecca E. Evans, Program Manager, Research and Educational Programs. 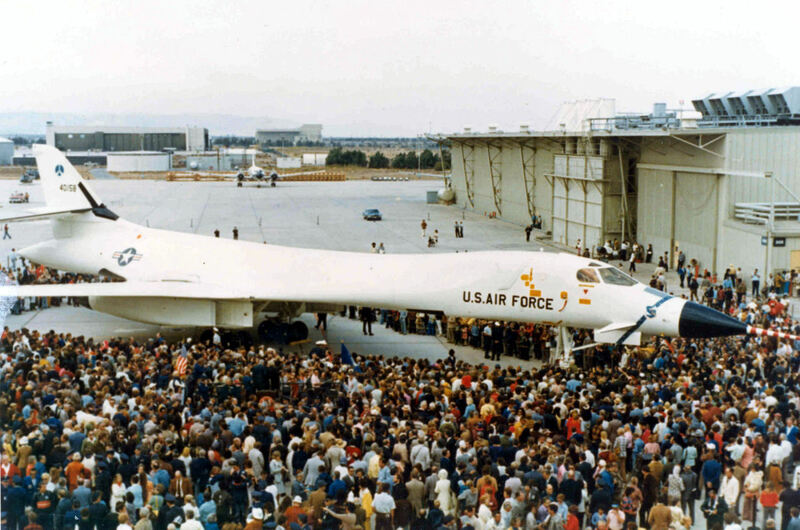 Thirty-seven years ago this month, the first USAF/Rockwell B-1A multi-role strategic bomber was rolled-out at the contractor’s USAF Plant 42 facility in Palmdale, California. The swing-wing, supersonic aircraft was intended to replace the venerable USAF/Boeing B-52 Stratofortress. The USAF/Rockwell B-1A Lancer was the product of 1960’s-era Air Force studies calling for a supersonic-capable, low-level penetration bomber. North American Rockwell was awarded a contract to manufacture and test four (4) prototype airframes (S/N’s 74-0158, 74-0159, 74-0160 and 76-0174) in 1970. General Electric was selected as the powerplant provider. The B-1A was designed for both Mach 2.3 flight at 50,000 feet and Mach 0.85 flight at sea level. The aircraft was able to satisfy these requirements by virtue of several design features. Formost among these was the aircraft’s ability to adjust its wing sweep in flight. Coupled with its sleek, aerodynamically-efficient fuselage, this gave the aircraft very low wave drag. Another key element were the type’s quartet of General Electric F-101 turbofan engines which generated a total of 120,000 lbs of afterburner thrust at sea level. Thrust performance was optimized through the use of variable-geometry air intakes. The B-1A measured 150.2 feet in length and featured a wing span that could be varied in flight from 136.7 feet (15-deg sweep) to 78.2 feet (67.5-deg sweep). Gross take-off and empty weights were 395,000 lbs and 115,000 lbs, respectively. Unrefueld range was 5,300 nm. The aircraft was designed to carry 75,000 lbs of nuclear and/or conventional ordnance internally and up to 40,000 lbs externally. Operationally, the B-1A’s four-man crew would consist of aircraft commander, pilot, offensive systems officer and defensive systems officer. The No. 1 B-1A (S/N 74-0158) was rolled out for the public on Saturday, 26 October 1974. About 10,000 people attended this event which took place at Rockwell’s facility on USAF Plant 42 property in Palmdale, California. The big, white, sleek aircraft was visually stunning and bore a majestic presence. The media covered the event in some detail. The No. 1 B-1A took-off for the first time from USAF Plant 42 on Monday, 23 December 1974. The flight test aircrew included Charles Bock, Jr. (aircraft commander), Col. Emil (Ted) Sturmthal (pilot) and Richard Abrams (flight test engineer). The aircraft’s landing gear was not retracted and wing sweep was not varied during this initial flight test. These systems were operated on the type’s second flight test which occurred on Thursday, 23 January 1975. Each of the B-1A prototypes served a distinct role in the aircraft’s flight test program. The No. 1 aircraft (74-0158) was the flying qualities evaluation testbed. It flew 79 times (405.3 hours) and was the first B-1A to hit Mach 1.5 (Oct 1975) as well as Mach 2 (Apr 1976). Aircraft No. 2 (S/N 74-0159) evaluated structural loading parameters, flew 60 times (282.5 hours), and achieved the highest Mach number of any B-1A aircraft (Mach 2.22 on Oct 1978). Aircraft No. 3 (S/N 74-0160) amassed 138 flights (829.4 hours) as an offensive and defensive systems testbed. Aircraft No. 4 (76-0174) had a similar role in that it tested essentially operational versions of the offensive and defensive systems. It flew 70 times (378 hours). The B-1A program was cancelled by the Carter Administration in June of 1977. While it never attained operational status, the aircraft broke new ground in mutiple areas including aircraft design, aerodynamics, flight performance, and electronic warfare. Indeed, the multiple technological capabilities that it pioneered were ultimately exploited in the type’s direct heir; today’s USAF B-1B Lancer. Fifty-two years ago this month, the USAF Bold Orion air-launched ballistic missile performed a successful intercept of the Explorer VI satellite. This event marked the first time in history that a endoatmospherically-launched missile intercepted a target vehicle in space. Bold Orion was a 1950’s-era air-launched ballistic missile (ALBM) prototype developed by Martin Aircraft for the United States Air Force (USAF). It was part of USAF’s Weapons System 199 (WS-199) research and development program. The goal of WS-199 was to develop technology to be used in emerging strategic weapons systems by the Strategic Air Command (SAC). The Bold Orion was developed using components obtained from existing missile systems as a cost savings measure. The missile was initially configured as a single stage vehicle. Power was provided by a Thiokol TX-20 Sergeant solid rocket motor. However, preliminary flight tests showed that the vehicle lacked sufficient kinematic performance. The addition of an ABL X-248 Altair solid rocket motor made Bold Orion a two-stage vehicle. The two-stage Bold Orion configuration was 37 feet in length and had a maximum diameter of 31 inches. 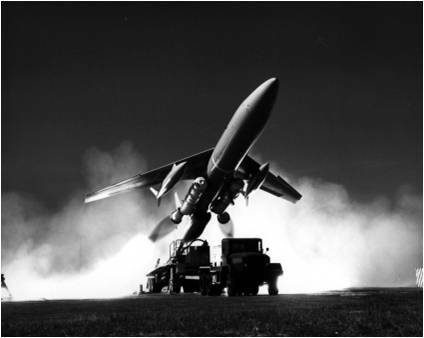 The vehicle was air-launched from a USAF/Boeing B-47 Stratojet aircraft. Missile launch occurred while the carrier aircraft executed a zoom climb maneuver. The option was available to fly either a maximum range endoatmospheric mission (about 1,000 nm) or achieve exoatmospheric altitudes as high as 150 nm. The Bold Orion flight test program consisted of a dozen missions. The first six of these were single-stage vehicles which were flown between May and November of 1958. The remaining rounds were two-stage configurations which were tested between December of 1958 and October of 1959. All missions were air-launched off the coast of Florida and flown down the Eastern Test Range. Bold Orion’s grandest moment came on the occasion of its final flight. The goal was to test the vehicle’s ability to perform in the anti-satellite (ASAT)role. The Explorer VI satellite served as the mission target. A direct hit was not required since an actual interceptor would be configured with a nuclear warhead. In that scenario, detonation of the warhead within several miles of the target would be sufficient to destroy it. Bold Orion’s ASAT mission occurred on Tuesday, 13 October 1959. Launch took place within the Atlantic Missile Range Drop Zone (AMR DZ). The altitude, latitude and longitude of the drop point were 35,000 feet, 29 deg North and 79 deg West, respectively. Bold Orion successfully intercepted the Explorer 6 satellite, passing its target at a range of less than 3.5 nm and an altitude of 136 nm. The Bold Orion ASAT test marked the first interception of a satellite in space and verified the feasibility of an ASAT system. However, negative political ramifications came along with technical success. Specifically, the Eisenhower Administration intended to keep space neutral. Bold Orion’s overtones of hostile intent did not play well with that mandate. As a result, ASAT development within the United States was halted not long after Bold Orion’s final mission. Bold Orion’s success gave USAF the flight experience and technology to develop the Skybolt ALBM. Known as GAM-87, this two-stage missile sported a W59 thermonuclear warhead with a yield of 1.2 megatons. A quartet of pylon-mounted Skybolt missiles would be carried by and air-launched from a USAF/Boeing B-52H Stratofortress. While Skybolt’s kinematic performance was impressive, test problems and the development of the Submarine-Launched Ballistic Missile (SLBM) ultimately led to its cancellation.